A delicious yet simple tomato sauce for pasta recipe is a great thing to have in your mid-week repertoire. Not only is a great tomato sauce with pasta a terrific meal for when you come in from work late - exhausted, but would rather not eat junk food or reach for the takeaway menu - it’s also really cheap! 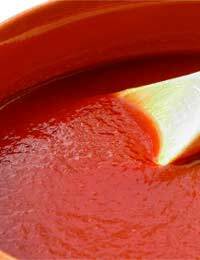 In fact, good tomato sauce is so cheap that once you have made it the first time, you will cringe when you think of how much you used to shell out for a little glass jar that was made in a factory – more expensive and probably not as good for you. When you have mastered a great basic tomato sauce, you can learn all sorts of little tricks. Crispy grilled bacon, some wilted spinach, pine nuts and chilli flakes all add a little something extra to your sauce, although it’s great just on it’s own! Don’t forget that a rich, unctuous tomato sauce is perfect stirred through good quality pasta, cooked al dente in plenty of salted water (top tip – don’t put the lid on while you cook the pasta – it makes it go too sticky), but it is also the perfect partner to toasted ciabatta (add a little mozzarella for a light lunch), chunky chips and roasted vegetables. So, How To Make This Versatile Sauce? It would be possible to say that you simply have to start with the very best fresh tomatoes, put them in boiling water, score and take off the skins, then de-seed and chop. It is also possible, far easier and just as delicious to start with a couple of tins of chopped tomatoes. As long as you buy good quality, Italian chopped tomatoes, you really won’t notice the difference in the finished sauce. Where you will notice the difference is if you buy cheap tinned tomatoes as they tend to have more water and less flavour. However, even the cheapest tinned tomatoes can be greatly improved by a good simmer and a good pinch of sugar. The ingredients you need, as well as the tomatoes, are a couple of juicy cloves of garlic, a glug of olive oil, some fresh basil (use dried oregano if you can’t get it, rather than dried basil) and seasoning. Start by putting the olive oil into a deep bottomed pan and onto a low heat. Add your chopped or crushed garlic – don’t let it burn as it tastes bitter and will permeate the sauce – just until it’s fragrant. Now add your chopped tomatoes and a pinch of sugar if they’re not great quality. Let it cook down on a low heat for as long as you can – ten minutes will do, but thirty or forty is better. Towards the end, just after you’ve put your pasta on to cook, give the sauce a good grind of black pepper and a generous pinch of salt – sea salt has the best flavour. Tear up your fresh basil (chopping bruises it) and stir it in right at the end – if you’re using dried herbs add it with the tomatoes so the dried flavour cooks out. It’s now ready to serve. To do it the Italian way, stir the sauce through the pasta, rather than have a big dollop of sauce in the middle of the plate on top of the pasta. Grate over plenty of fresh parmesan and pour a glass of Chianti and you have a great night waiting to happen!